Once upon a time, in a gaming realm called VrChat, everyone was fee to be whoever and whatever they wanted. However, as of the end of December, a group of "deformed, obese" Knuckles from the cartoon series Sonic the Hedgehog came about. Looking at Youtube videos, they have been constantly harassing other people by being rude in the game, their actions include asking "Do you know the way? ", "spitting" on them, making "clucking" noises and even harassing others who have taken on female personas. People of the VrChat are powerless to stop them as these people stay behind the keyboard and annoy people to no end. Inspired by the way they carry out their action, we have created this project called "The way of the Knuckles". Basically, Knuckles makes an absurd amount of noise when left alone. It can be _ silenced _ by shaking him constantly. The moment you stop, it will start to make a lot of noise again. The harder you shake it, the quieter it becomes. Knuckles was built of of an arduino nano, and it's main feature is made possible through an accelerometer, namely the mdu6050. I have used and modified the example code given in the mdu6050 library. Finally, when Knuckles has been silenced, his nose turns green as a sign of being sick. The mdu6050 we had was in pretty bad shape, It's FIFO is always overflowed and the program would come to a stop. It wasn't until the last 5 hours in the Hackathon did we found out how to fix it, we re-soldered the pins that were loose and made sure the board wasn't heating up again before we finally patched the whole project up. We had no color pencils, paper, nor transparent tape as we weren't planning to make something reliant on appearance. We had to improvise to make a least viable product to keep its charm. Luckily we had a team of reliable members to back each other up. We are happy that we got this project out, even though it isn't as grand as other social projects, nor was it as complex as other robotics project, we were really enjoying our time whilst having a deeper understanding on the various useful sensors, some of which were not used in our final iteration of the project. 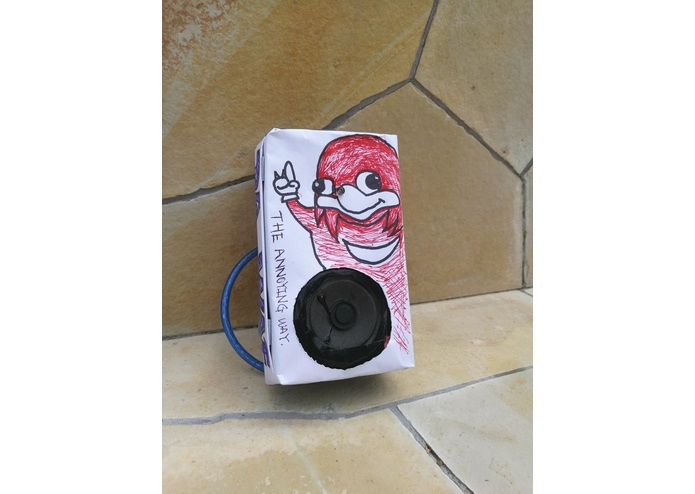 We were really surprised how this product turned out after having Knuckles himself on the product. It just made it that much more interesting. We've learnt how to control and extract information from an accelerometer. Besides that, we've also learnt a bit on other topics such as openCV, Machine Learning, Python GUI, Python 3, hardware such as 4 digit 7 segment display, arduino nano, soldering etc. We hope the way of the Knuckles to stop soon, as this is the exact reason it is made. However, we can easily remodel it into another toy and reverse the main function, where the harder it is shaked, the greater the feedback will be. All of us feel somewhat relieved of stressed after we've played this annoying toy.